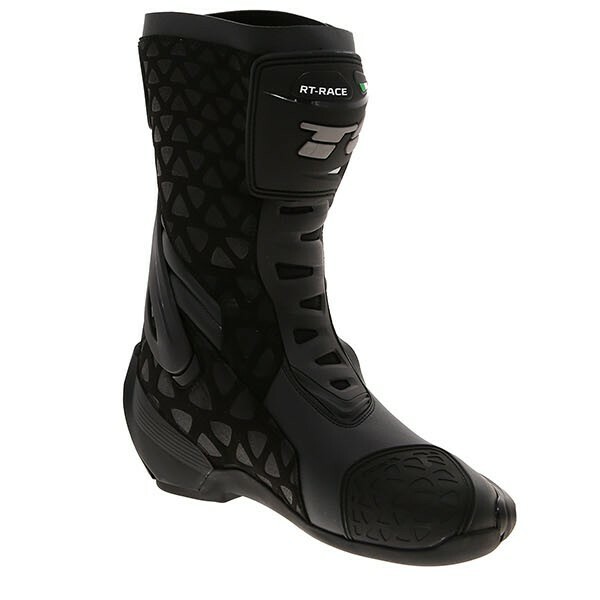 When TCX said “hey, do you want to try some of the RT Race boots?”, I said “yes please”, and there’s a reason why: because they’re about the closest thing, both visually and physically, that I can get to my old pair of Alpinestars SMX Plus boots from about 2010. I loved those things – comfy, good looking, durable and despite not being waterproof, did a bloody good job of being as waterproof as not-waterproof boots could ever be… if that makes sense. They’d done trackdays, touring, commuting the lot. Last year, after untold thousands of miles worth of use and abuse, they finally gave up the ghost and I had to chuck ’em in the bin. The soles were wearing through, the zip in the right-hand boot had broken, the toesliders were toast and, er, you could smell them from the next county over. I was sad. So any replacement had a lot to live up to, and the RT Races look to be the closest thing. I’ve had these TCX RT Race boots for about 6 months now and I think, actually, they’re even better my beloved AStars were. 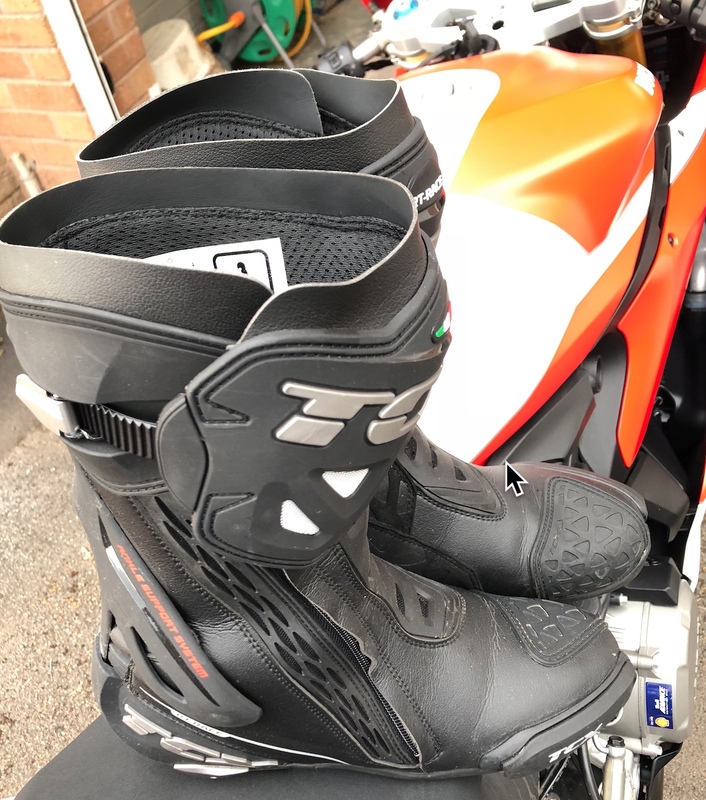 They look just as good (if not better, in my opinion) are better built, and might even become my new favourite do-it-all road and track boots. What you’ve got with the Race RTs is race-styled outer and a super comfy inner (and it’s the comfort that really makes the difference). The lining’s nice and soft and the insole is substantial with really good padding. Ankle protection feels especially rugged with dual density foam, and there’s an entire flex control outer which wraps around the back of the boot which, I think, looks like it’d do a fairly good job in a crash. Not that I intend to find out. These things are ridiculously comfy right from new, and they don’t rub if you need to walk a few thousand yards in them. There’s a zip which goes right down the side meaning they’re easy to slip on and off, and a ratchet-strap adjuster around the calf protection to tighten (or loosen) once you’ve got them on (they call it FFC, or Fasten Fit Control). Handily, the FFC system has a decently sized big buckle so you can use it without having to take your gloves off (as long as they aren’t big, fat winter jobbies). Once of the nicest features is the microfibre outer on the inside of the boot. This is apparently heat shielding, but it has the added benefit of being soft, so your bike won’t get all scratched and scuffed up as you move around the bike, and it’s got a rubbery mesh overlaid which aids with grip when you’re really hanging off. 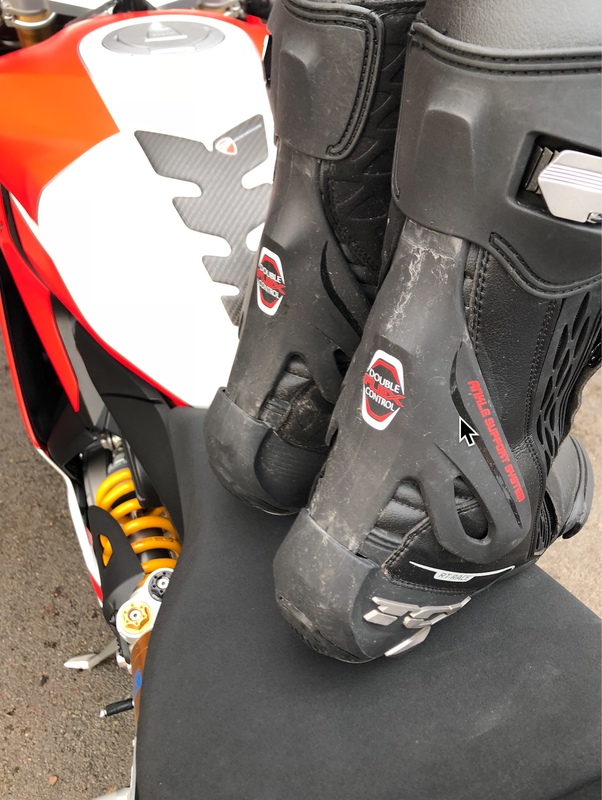 The toe sliders are metal, rather than plastic – they’ll last way longer as a result (plastic disappears awfully fast) and it’s just a simple removal of one bolt to replace them when they do eventually wear out. We’ve had one of the hottest summers in the UK and throughout, and even down into Europe on a long rip, they remained breathable and not overly sweaty. They’re fairly lightweight too – not so light as to make you question the quality (like the aforementioned Astars…), and not too heavy as to be clumsy. The sole seems pretty grippy on various ‘pegs, but I’ve yet to properly test them on a grimey petrol station forecourt, but so far, so good. Highly recommended thus far, and we’ll update you again in another few months to let you know the final verdict. Available now from £199.99 via Bikestop in a range of colours, and also available in a waterproof (WP) edition.